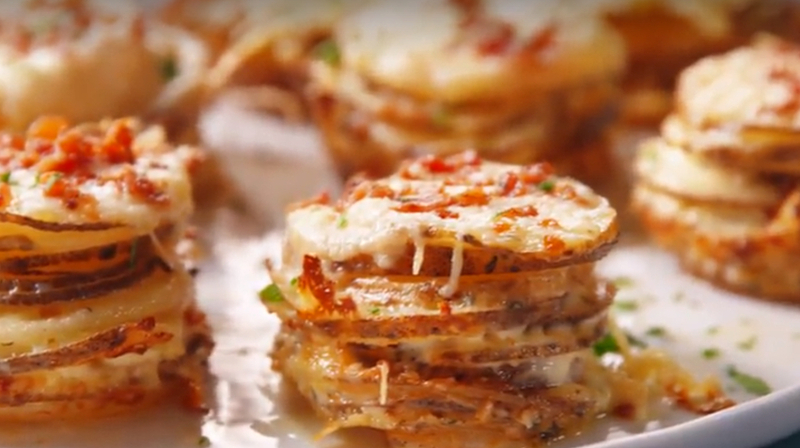 For day 3 of our 10 days of Thanksgiving, we would like to share this Potato Gratin Stacks recipe with you. These Thanksgiving day appetizer snacks are not only super easy to make, but they are super delicious, especially when topped with Arps Dairy’s cool and tart Sour Cream. Preheat oven to 350° and grease a standard 12-cup muffin tin with cooking spray. Toss potatoes in Arps Dairy Half-and-Half, garlic powder, nutmeg, pepper, thyme, salt, and Parmesan. Divide the potato mixture between muffin tin cups to create 12 potato stacks. Cover with foil and bake until tender, 40 minutes. Uncover the muffin tin and top each potato stack with gruyère and bacon. Bake until cheese is melted and the sides are beginning to turn golden, 20 minutes more. Garnish with parsley and let cool in pan for at least 10 minutes before serving. Top with Arps Dairy Sour Cream and serve warm.